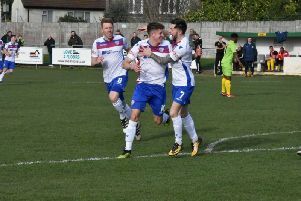 Andy Peaks was delighted to see his AFC Rushden & Diamonds side rescue what he felt was a “deserved” point as they claimed a 1-1 draw at Lowestoft Town. Diamonds fell behind in the first half and left it late to take a share of the spoils as Ben Farrell scored from the penalty spot in the final minute after John Dean had been fouled in the area. The draw keeps Peaks’ side in seventh place and just one point off the play-off places in the Evo-Stik League South Premier Division Central. And the manager said: “We left it late but I am delighted with a point. “We had plenty of possession throughout the whole game but particularly in the second half. “The real disappointment was that we didn’t have enough quality in the final third at times, we had a lot of the ball but we didn’t deliver a final pass when we needed to. “But we always tell the boys to keep believing and keep doing what the right things and if you do that then you will get your rewards and that’s what happened in the end. That point may have come at a cost, however, as Diamonds captain Liam Dolman was forced off with a calf injury early in the second half. And with Jack Westbrook, who has filled in at centre-half this season, set to begin a three-match suspension, it has left Peaks with a bit to think about ahead of Tuesday’s clash with Halesowen Town at Hayden Road. “I don’t bring Bully (Dolman) off unless I really have to so that tells you it’s a sore one,” Peaks added. “We will just have to see how it settles down but it’s obviously a blow for us.